I’m in the process of deGoogling, in preparation for an /e/ phone, and journalling my journey. And, despite Google’s claim that their competition is only ever one click away, I’m finding it a much more involved process. Its partly about the technical changes to software and settings, but the bigger bit is the personal/ habit changes. Thanks for the feedback and tips everyone! Some Google products I can’t just go cold-turkey on in one leap, and what I’m doing as a first step for these is to shift them away from being defaults, and to move them from being ‘always on’ to ‘sign in and out when needed’. (It takes some discipline to change habits, but ongoing discipline is going to be needed anyway). Google Search is still available, but it was quite easy to set up spot, /e/'s search engine, as the default on Firefox (*). If I don’t get the results I need there easily (I’m used to google knowing what I want before I ask), it’s only a click to do the same search on google. I don’t remember asking for Google Voice Search, but it was there as an app on my phone, and now it is not. Google Drive will still be around as long as I have a google account, but you can access this online without having to have it installed as an app. So after checking through for files I want to still be available offline, and moving them to another service, I have removed Google Drive, Docs and Sheets as apps off my phone. I can still edit edit their files off the webpage , but the change means I can’t edit files offline. I have yet to check whether I can run Google Maps and Google Play via the web rather than via the app, so they are still on my phone as apps for the moment. Gmail is accessed as a website on Firefox on my Windows computer, but on my phone I’m still using the app for the moment - notifications being the sticking point. The next bit will be, as planned, about how my experiments with my own homepage + resurrecting an RSS feed reader have made a big difference to how I interact with the internet. (*) I wrote a bit soon on this one: while on Firefox Android on my phone, adding an address as a new search engine was an easy process, on Firefox Windows it took a while to get to how to do it: type spot.ecloud.global in the address bar, then on the three dots menu there is an option to ‘add search engine’ (ie you don’t have to install it as an add-on as would appear from the options|search page). Then you can go and set it as default. If I don’t get the results I need there easily (I’m used to google knowing what I want before I ask), it’s only a click to do the same search on google. If you want to get Google search results but with more privacy, then https://www.startpage.com/au/what-makes-startpage-special.html might be worth checking out. I use it as my fallback search engine. you are making great progress! It is great to see this documented for others to see your journey as it happen. For a browser you can also try Vivaldi for the desktop. It can use the same Chrome extensions. Brave is also a good browser for mobile devices that has built in security features. For offline access to files check out SyncThing. You set it up on two or more devices (like your desktop and phone) and any linked folders automatically sync. The advantage is you don’t need to use any cloud services, everything is only saved on devices you control. The disadvantage is everything is synced onto your device, so be aware of how much space each sync folder is using. You can setup multiple folders to sync with different devices, so you could have a Pictures folder on your desktop you choose to not sync with your phone. Google Play requires a login to use so if you use the website you still have to use your google account. However if you install the Yalp Store app (available in F-Droid) you can have Yalp log into with it’s own credentials to download free apps. You can also choose to use your own account with Yalp if you need to access your purchased apps. There are several great email apps that you can use to access your gmail, I recommend BlueMail, and yes it does have notifications. Of course /e/ has its own built in mail app too. Instead of building a homepage you could use link archiving websites like pinboard.in. Or on your phone create home screen links to websites and put them all in a folder. But those won’t transfer to any other device. I think Firefox may have bookmark syncing if you create an account, but I have never tried that. De-googled my computer years ago, used Chromium (the original browser before Google ruined it) for a while but replaced it with Vivaldi. Firefox remains the default browser. 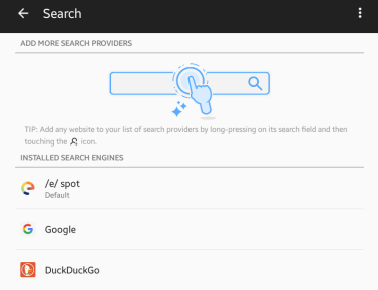 Search engines: DuckDuckGo (default) Ixquick (now Startpage, Ixquick.eu only exists in France, no longer available in all 23 official EU languages, it is “orphaned” one could say) and Qwant https://lite.qwant.com/ what seems to be the same search engine as https://spot.ecloud.global/ ? The only real problem in de-googling are all these websites that use Services as a Software Substitute from Google as gstatic, google-tag-manager, google-analytics and so on. I block Google what makes it impossible to login on some websites, even some public or government websites! This is also an issue that is annoying me. Recently I found out about FoxyProxy, which might provide a solution for this (by automatically accessing certain URLs via proxies) and which I want to check out. Brave has these built in, but maybe not the IDCAC. You can download Firefox for Android and install all the same plugins. Thank you, it was impossible in “Firefox Klar” what isn’t recognized by Firefox as being Firefox. Yes Klar is a specialized version. You can get Firefox with the Yalp Store app which gets it from the Google play store. So you will need to install Yalp from F-Droid, then install Firefox from Yalp. So you will need to install Yalp from F-Droid, then install Firefox from Yalp. Using Yalp isn’t reGoogling your smartphone in a way? It is a candid question. I really want to deGoogling my smartphone but I’m a bit concerned about the impact of microG and the potential installation of Yalp.